Is there any reason we shouldn't run a USB mouse and the Magic Mouse together at once? The circumstance: I've discovered that I can use both mice at once; Magic Mouse to control multitouch functions in a composition and USB mouse to simultaneously control other composition parameters. For this experiment I disabled all the scrolling functions in the Magic Mouse. The implications? Play the composition with two hands. So ... tell me it's ok, somebody. It's a really significant capability if consistently viable, imho. Re: MultitouchPatch. Two mice at once? it's ok. USB is designed to deal with this without any problems. I've successfully done dual-mouse setups on Linux, Windows XP, and Mac OS X, all without problems (linux stuff dating back to 2002-2003ish, winxp more recently, and OS X from 2007 to present). (for really fancy/weird setups, you can use each mouse exclusively via HID, and have 2 live mouse pointers at the same thing. UIs generally don't accept that because it's weird, but custom apps can make use of that (in theory -- I've never seen it used outside some college experiments)). Oh wow! Thanks! This is too cool. It works simultaneously with separate applications too, needless to say. The visualists are going to just love it, I predict. Delightful! 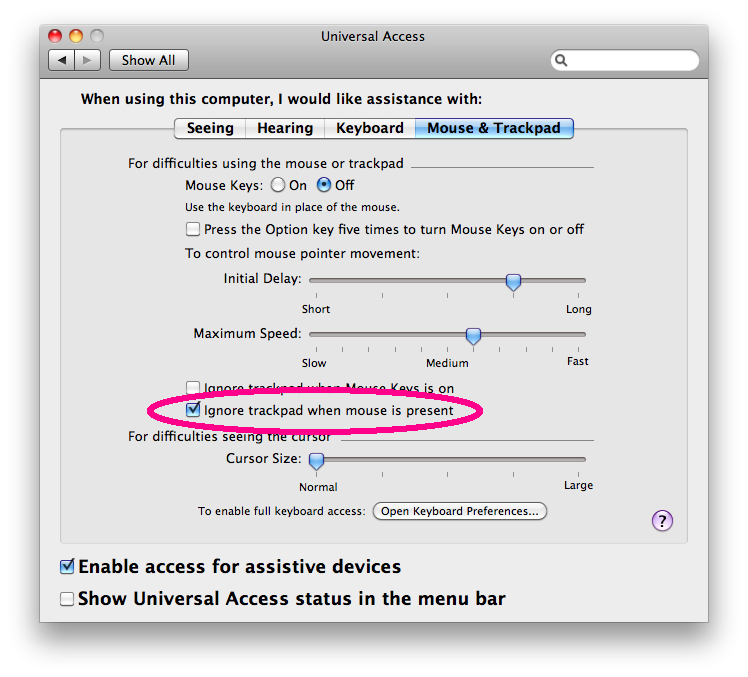 One other possibility, if you're using a MacBook(Pro): in the Universal Access prefpane, you can check the "Ignore trackpad when mouse is present" option --- the trackpad will no longer move the pointer, but MultitouchPatch will still provide trackpad touch info. Incidentally; if purchased online, the Magic Mouse ships in a pliable, molded foam protective encasing. This molded foam shipping protector has reasonable surface adhesion and it works well as a stationary mount for that multitouch device. Handy! No need to go assemble a housing. i don't know if anybody is interested, but i started implementing some basic multi-cursor or pointer multi-touch stuff system wide for os-x using tuio and my apple script plug-in. its more of an experiment i can post when i have a decent working system. basically i'm using an apple script plugin with an apple script add on that lets you hide the mouse as well as move finder windows around. my idea was to build a transparent app that runs on top of the finder giving you mulit-touch cursor visualization. seeing that the apple script plugin updates every frame i am able to send x and x position data to finder windows that smoothly moves them around like as if you had multiple pointers. essentially letting you move one finder window with one finger and another with the a second finger. its no where near some sort of software HID natural user interface or os-x multi-touch driver but i started thinking of ways to do that with QC. so if anybody is interested or has a MT table you might be able to use it, although running the java tuio mouse driver with a tuio server might be a better option to using your mac system wide as multitouch ? let me know if you want to try and it and i will send you a link but would rather not post something that messes with the pointer and moves windows and stuff for obvious reasons. so it would be a use at own risk type of thing. not that there is any rick but you'll have to have some idea of what your doing seeing there is the whole widow z ordering and hiding of the cursor. the transparent app that runs at cursor level has not been made so its just a qc file. maybe i will look for it if someone is interested and post anyways ? I can report that the MultitouchPatch enabled compositions are functional in both VDMX and CamTwist and that the dual mouse scenario works with both of those applications, too. Caveat in regard to Magic Mouse: It appears that it may be necessary that the Magic Mouse be powered on and active prior to opening the multitouch enabled compositions in the applications mentioned above. This is definitely true for CamTwist. I don't know VDMX well enough yet to verify, however. Some 3rd party apps don't recognize cursor focus in the same way that a QC viewer window does, a consequence of which is that with compositions which utilize the trackball patch, the trackball function can't be accessed in those applications. But I am seeing that the Magic Mouse does indeed send multitouch data into at least one of these applications (CamTwist) and that multitouch compositions in that app retain focus for the mouse's multitouch data input regardless as to whatever may be occurring with a secondary USB mouse. I thought perhaps that it might be possible to enable a trackball alternative by accessing XYZ rotations with the Magic Mouse? But I don't know how to assemble the necessary composition. Would such a functionality be somehow achievable? Example composition? Bug with cwright's "draw in space"?